The Greta Constantine show has been taking place off site for the last several seasons and this season the show took place on the Friday before official World Mastercard Fashion Week began; actually they’ve been doing the show on the Friday before for a while now. In any case I took two days off from the pre-fashion week shows and didn’t attend this show I just know that the collection was well received. So no review from me I’m just posting the pics for us all to enjoy at the same time. Entering the tents on day two had me in two states simultaneously, exhaustion and excitement. I think that most bloggers and editors alike feel this way when it comes to any fashion week that they are covering, but to feel this way on Day 2, only leads me to believe I went a lil too hard on Day 1. So I dragged (really there was no dragging involved), myself into the tents for Day 2 all set to watch Soia & Kyo. No real expectations but secretly I hoped it would be different from Mackage, another outer wear collection that I recently saw, and it was. Soia & Kyo managed to deliver an “every mans” collection. What do I mean, well their collection could be seen on and worn by everyone. Literally everyone, there wasn’t a style that wasn’t represented in the collection. In other words it was the perfect collection for those people who want their outer wear to be a cohesive part of their outfit. Not to have it stand out in any way but just to pull the whole thing together nicely. With the way that the collection was styled it showed that each piece was totally capable of doing just that. We’ve seen a trend toward less bulk in outer wear over the last several seasons and Soia & Kyo’s F/W 2012 collection stayed on trend. The collection was composed primarily of tans, camels and browns, with hints of grey and some black with occasional pops of mustard. I was a fan of the mustard bomber jacket with knit cuffs and collar. I would recommend this collection for anyone who is looking for a reliable well cut coat that you can take from day to night. Check out the pics below…. 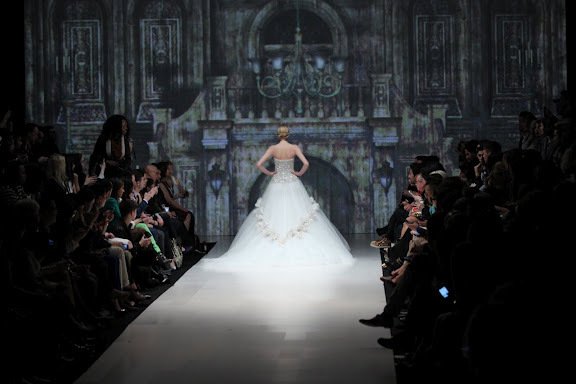 If you have been following my blog and reading the coverage from the past seasons you will know that Korhani is a home furnishing company that has been presenting at Toronto Fashion Week for the last few seasons. To their credit they have been out doing some of the conventional designers. Specifically in their execution, and style of show that they present. As such they have quickly become a must-see show. This season was no different, except that they had the daunting task of being the show that opened Fashion Week. Now having seen the previous two seasons from Kristen Korhani I knew that this show would be unique, that there would be as much show as there would be fashion and there would be a surprise; I was not disappointed. The Korhani home collection took us around the world and back again. Their opening section featured Oriental inspired looks from the hair and make-up to the styling; imagine a carpet kimono. Who but Korhani could do that? We were taken to Mongolia with a quick stop in Russia before we were dropped smack dab in the middle of London at the height of its punk revolution. I know I’m telling you what happened but all of this was done with carpet if you can believe it. Finally we landed in Venice at a masquerade ball where the tapestries were not hung on a wall but were worn by the guests. The show was marvelous. Inventive and as exquiste in the design and detail as I expected. Oh and the models coming down the runway with the pot belly piglets didn’t hurt either..that was the surprise. My first introduction to this line was at the request of a potential client in regard to a look he wanted for a photo shoot. I didn’t know anything about the line except that they were a Canadian label and designed outer wear, pretty extensive knowledge base huh…rolls eyes…So when I got the invitation for Mackage I was quite excited to go; I love outer wear and think that it’s just as important as what you have on underneath; I was expecting nothing though. The show was in the distillery district and I had never been there before and might not have made it that day either if it was up to Mapquest they would have had me in Scarborough, No Bueno! I made it to the show with more than enough time to schmooze with the Blogger Brigade as I like to call them, grab a cotton candy flavoured drink and head to my seat. The show was a highly anticipated one as it featured international model Heather Marks and tattoo model Zombie boy. Overall the collection was edgy to a fault complete with military inspired head pieces designed by Banoo by Mesa a Toronto based headwear design duo who are making their own name for themselves and was extremely well styled. There was a range in pieces from casual to dressy; fabricated in wool, nylon, and leather. I could see Rooney Mara’s character in The Girl with the Dragon Tattoo wearing any of them. As a matter of fact at the time I hadn’t seen the movie yet but I kept thinking that there must have been some inspiration from there. It’s the last day of November and the fashion calendar is winding down as people begin to make holiday preparations and travel plans for the upcoming Fall/Winter season. That can only mean one thing, it’s time again for the Victoria Secret Angels to make their way down the runway. This show has everything that I love about fashion! It has spectacle, beautiful models, great lighting and sound production and A-MA-ZING clothes! Well not quite clothes as there is very little that the models wear but they are stunning nonetheless. It’s the reason why I tune in to watch religiously every year, it’s the same reason why my ultimate desire is to be sitting in one of those coveted seats some time in the near future and it’s also the reason why I am writing this post today! Oh yeah one more thing; the chaos. Of course it would have to take an insane amount of people to pull something like this off, especially on this level in front of millions of people. Lucky for us the Victoria Secret show holds back no punches! They let us in on what’s really happening behind the scenes! So of course I LOVE that! So naturally I bring you video from backstage at the show! I hope you enjoy and hopefully next year I’ll be backstage too! Not as a model of course let’s not be ridiculous!